The United States had the UK arrest WikiLeaks founder Julian Assange today, just weeks after Robert Mueller ceased working on his Trump-Russia investigation. Did William Barr have Assange arrested in order to shut him up before he can spill the beans, or did legitimate factions of the DOJ have Assange arrested in the hope of helping expose the Trump-Russia truth? That answer will ultimately be delivered by superseding indictments against Assange, or lack thereof. Months ago, the U.S. government unwittingly revealed in an improperly redacted court filing that Julian Assange had already been criminally charged, but didn’t reveal what those charges were about. When Assange was arrested today, it was revealed that the United States has charged him for his role in an alleged criminal hacking conspiracy from nearly a decade ago. These charges have nothing to do with Trump-Russia. It’s enough to get Assange extradited to the U.S., but it doesn’t tell us anything – yet. If you’ve watched the Trump-Russia probe unfold, you’re familiar with the concept of superseding indictments. Robert Mueller initially charged Paul Manafort with a number of crimes in order to arrest him and get the legal process started. As the probe went on, Mueller tacked on several more superseding indictments. We’ve also seen Mueller charge Roger Stone with several crimes, yet last week we learned that Mueller’s grand jury – now in the hands of a new prosecutor – is still pursuing additional charges against Stone. 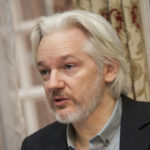 Now that the initial charge against Julian Assange has been unsealed and he’s been arrested, the big question is whether he’ll also end up being charged for his role in criminally conspiring with Russian government hackers to steal and release DNC emails during the 2016 election, while allegedly communicating with Stone about it. If a superseding indictment is brought against Assange for this, then we can conclude that he was arrested for the legitimate reason of exposing the Trump-Russia scandal. If Assange is never indicted for anything beyond today’s charges, we can assume Barr had him arrested in the hope of making him go away.